At Kitrx we welcome this assistance in migrating our clients from burdensome and expensive Exchange Servers and allows us to provide flat rate pricing for this service. 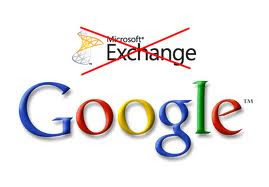 "I had been a Microsoft Exchange user and administrator for more than 10 years, so I assumed we’d go with Microsoft Exchange and Outlook clients. Then I thought about our overtaxed IT staff of five, and what would be required from them to set up and run Exchange. We would need to purchase, configure, integrate, manage and maintain many hardware and software components. We would also have to worry about our 50 mobile users and managing client software for their devices, too. I was also thinking about the cost for all of the required hardware and software. It would be a significant investment. Then we started looking at Google Apps. The move to a cloud computing model really made sense for us because we wouldn’t have to worry about mail servers, updates to the software, backups, softwarerollouts to desktops or mobile users, and constant maintenance. Google Apps’ features met our requirements and provided 50-85% in cost savings to maintaining our old system or moving to Microsoft Exchange – either on-premise or hosted. With Google Apps, we got a complete messaging solution with anti-spam protection, disaster recovery and a 99.9%uptime SLA built-in. We also got features for collaboration that came as an extra bonus to email – and we're now looking at different ways to use Google Sites and Google Docs to improve our collaboration, internally and with customers. But probably the feature that our employees love the most is chat, including video chat, which is fully integrated and included in the suite of apps."